Cut a long strip (about 15 inches length and width of about 5 inches) out of the tissue paper. Fold it into two. Now you have a 2-ply sheet of dimension 15* 2.5 inches. Cut the full stretch of the paper until the center (not on the folded side) with frequent intervals (about 1.5 cm). Twist the ends as shown in the above picture. 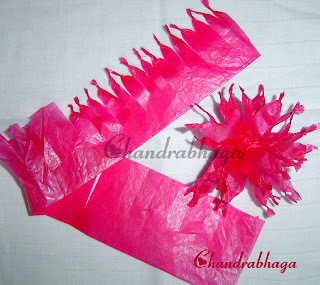 Starting at an end, crush and roll it to make a flower (Insert a metal string while rolling if you need a stem). Tie with a thread. 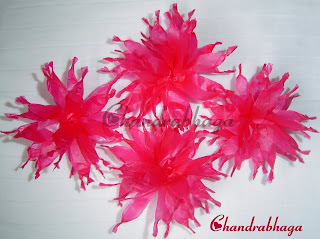 I used the festive tissue papers that is used for stuffing tote bags and gift boxes.